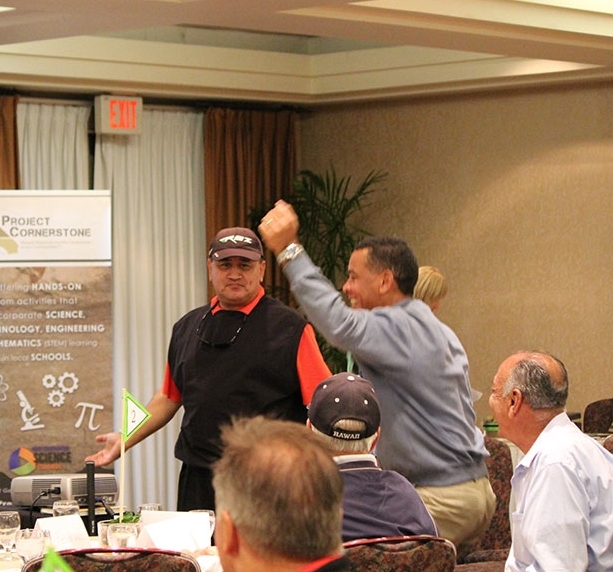 Project Cornerstone Receives Local Support at Inaugural Golf Tournament Fundraiser — Project Cornerstone, Inc.
San Diego, CA - Project Cornerstone, Inc. – a grassroots organization dedicated to educating the public about the importance of local construction aggregate resources like sand, gravel and crushed stone, successfully hosted its inaugural golf tournament fundraiser on November 21, 2014, at the Pala Mesa Resort in Fallbrook. The event was designed to raise funds for Project Cornerstone’s education and community outreach programs. The early-morning rain that fell on San Diego County would not threaten Project Cornerstone’s inaugural golf tournament or the organization’s drive to host a memorable event. By mid morning, the rain passed and the event started without a hitch. Nearly one hundred golfers participated in the inaugural golf tournament. Fifteen companies sponsored portions of the event. Fourteen companies donated products and services for the golfer’s gift bags and raffle prizes. View all golf tournament photos. As a result of many volunteers, sponsors and those who attended, the event raised over $7,000 to support Project Cornerstone’s mission. "It was great to see everyone come out and participate in our first event,” said executive director of Project Cornerstone, Crystal Howard. “We really appreciated everyone's eagerness to get involved and we were excited to award our top three teams with some amazing trophies that were representative of the industry. We look forward to hosting the event again next year." The dinner banquet following the tournament served as the Winter Quarterly Meeting. Crystal Howard delivered an overview of the organization’s recent activities. Project Cornerstone is already working to schedule its Second Annual Golf Tournament in 2015. Sponsors and volunteers interested in participating in next year’s event should contact Alyssa Burley at (619) 284-8515 or alyssa@project-cornerstone.org. Founded in 2014 by members of the construction aggregates industry, Project Cornerstone is a San Diego-based grassroots organization dedicated to educating the public about the importance of local construction aggregate resources like sand, gravel and crushed stone. Its goals are to inform the public that using locally sourced minerals have environmental and economic benefits; educate students how construction aggregate is produced and where it is used in their everyday lives; promote the use of local resources to satisfy demand; endorse the conservation of classified and designated mineral resources for future development.